Dental implants are a highly successful method of tooth replacement. Effective for any amount of tooth loss, they work by rebuilding your missing tooth’s structure from the root up. However, estimates say that 5 to 10 percent of dental implant procedures are unsuccessful. Dental implant failure is frustrating, expensive, and something to be avoided at all costs. As the expert on dental implants in Long Island, Dr. Mohr and our team stay abreast of the latest news out of the implant world — and we want to share with you a new study that discusses a method for improved dental implant procedures. Keep reading to learn more about the new possibilities to make dental implants even more successful! The vast majority of dental implant procedures are successful — but when they are not, the most common reason for failure is a condition known as “peri-implantitis.” This condition occurs when bacteria builds up around the dental implant, causing inflammation of the hard and soft oral tissues and interfering with the proper fusion between the jawbone and implant post. 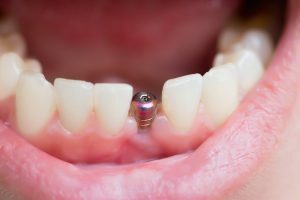 Peri-implantitis is most often caused by poor oral hygiene after implantation. Dental implant failure may occur right after implantation, when the posts never fuse together with the jawbone, or it may develop months or even years after initial implant success. A 2017 study originally published in the journal Nanotechnology and then summarized again on ScienceDaily.com details the work of a research team out of the University of Plymouth. By using a new coating for dental implants, the researchers found that they could eliminate the formation of bacteria to prevent biofilm build-up and the resulting peri-implantitis that causes dental implant failure. Traditional dental implants are made out of titanium, the material that allows the bone and implant post to fuse together. These researchers coated implant posts with silver, titanium oxide and hydroxyapatite nanocoatings which they concluded reduced the risk of bacterial buildup to encourage the success of dental implant procedures. This method makes the surface of dental implants antibacterial in the long-term — something that had not yet been attempted. Dental implants are currently the leading replacement option for people missing one, two, or many teeth. With advancements like these in the world of implant dentistry, we can see an even brighter future ahead for patients who experience tooth loss! Don’t hesitate to find out whether or not you can benefit from this comprehensive replacement option if you are missing teeth — because you deserve all the benefits of a complete, beautiful, lasting smile. Dr. Allan S. Mohr specializes in implant dentistry at ASM Smile Creations. To learn more about this comprehensive tooth replacement option, including whether or not you are a candidate, you are invited to contact the office at 516-541-7344.
by: allanmohr at June 29, 2018 .